Runco IDP-900a Projector and SC3050 Scan Doubler was attached to a rack and pinion lift and dropped down from its home in the ceiling above the seats. 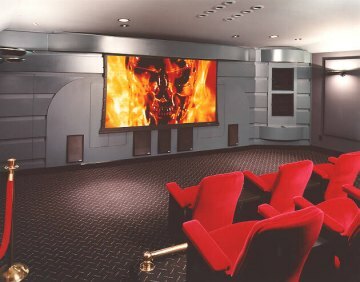 It and the Stewart screen were controlled by equipment from AMX, a company with really cool control hardware for home theaters, home automation, conference rooms, etc. There were seven Triad in-wall THX speakers, three up front and one on each side, in addition to the two 10" front subs. Two, 18" ceiling subs and the two 12" subs under the rear row of seats completed the room drivers. All the speakers were powered by six NAD THX amplifiers, a Lexicon CP3+ THX decoder, RANE THX Equalizer and a Pioneer CLD-D704 laser disc player. We also had several VCR's, and a RCA DSS dish available when TV was called for instead of laser disc movies. Back then, I added the ability to play Dolby Digital encoded laser discs by temporarily adding a Pioneer VSX-D3S receiver. We sold the house prior to replacing the receiver with the upgraded Lexicon.